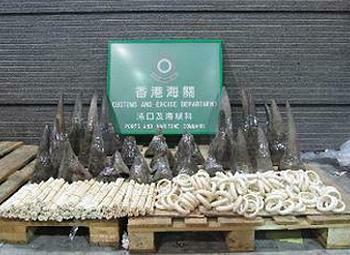 HONG KONG, China, November 16, 2011 ENS – Hong Kong Customs officials Monday smashed a smuggling case and seized 33 rhino horns, 758 ivory chopsticks and 127 ivory bracelets with a total value of about US$17.4 million. 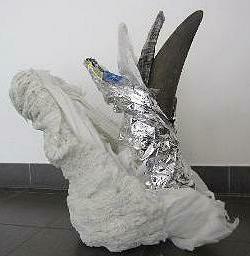 The contraband ivory and rhino horns were hidden inside a container shipped to Hong Kong from South Africa. Acting on a risk assessment, Customs officers selected a container for inspection that was declared to contain 63 packages of “scrap plastic” from a vessel arriving from Cape Town, South Africa. Under X-ray examination, officers found 33 rhino horns weighing 86.54 kg (191 pounds), 758 ivory chopsticks weighing 13.22 kg (29 pounds) and 127 ivory bracelets weighing 9.2 kg (20 pounds). The smugglers had concealed the horns and ivory inside a package of plastic scrap placed at the rear of the container and covered them in layers of tinfoil, paper and plastic to avoid detection. Officials say an investigation is underway but so far no arrests have been made. Hong Kong Customs officials say they will continue to maintain close contact with overseas law enforcement agencies to exchange intelligence valuable in combating transnational smuggling crimes. Under the Import and Export Ordinance, any person found guilty of importing unmanifested cargos is liable to a maximum fine of $2 million and imprisonment for seven years. In addition, under Hong Kong’s Protection of Endangered Species of Animals and Plants Ordinance, anyone found guilty of importing endangered species for commercial purposes is liable to a maximum fine of $5 million and imprisonment for two years. “This seizure bears all the hallmarks of a sophisticated organized crime gang that has shifted its smuggling method to sea freight to avoid detection,” said Crawford Allan, North American regional director of the wildlife trade monitoring network TRAFFIC. Rhino horn is in demand in Asia for its purported medicinal qualities. But rhino horn is composed of keratin, the substance that makes up hair and nails, and no scientific evidence has been found for its efficacy in treating any illness. Rhinos have been living on Earth for 60 million years, according to the global conservation organization WWF, which says that at one time there were hundreds of rhino species, ranging across Europe and into North America. Today, scientists recognize five species of rhinoceros – two in Africa, and three in Asia. 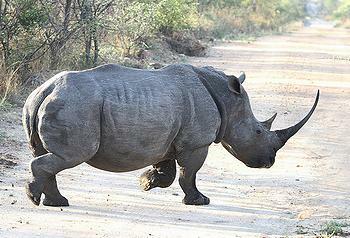 The African species are the black rhino, Diceros bicornis, and the white rhino, Ceratotherium simum. The Asian species include the Indian rhino, also called the greater one-horned rhino, Rhinoceros unicornis; the Javan rhino, Rhinoceros sondaicus; and the Sumatran rhino, Dicerorhinus sumatrensis. Of the five species of rhinoceros, three are critically endangered. Rhinos are listed in Appendix I of the Convention on International Trade in Endangered Species, which bans any international trade of rhino parts for commercial purposes. But this listing has not prevented a steep increase in poaching since 2006. South Africa has been the focal point for poachers because it has the largest population of rhinos in the world. A record 341 rhinos have been poached in South Africa so far this year, up from 333 in 2010. More than 90 percent of the world’s rhinos have disappeared since 1970. Today the total worldwide population of rhinos numbers less than 16,000. Few rhinos are left outside of national parks and other protected areas. The reassessment of several rhino species released November 10 by the International Union for the Conservation of Nature show that the subspecies of black rhino in western Africa, the western black rhino, Diceros bicornis longipes, has officially been declared Extinct. These rhinos were once widespread on the central-west African savannah but were wiped out by poachers. The Javan rhino is making its last stand, as the subspecies Rhinoceros sondaicus annasmiticus is probably Extinct, following the poaching of what is thought to be the last animal in Vietnam in 2010.
International trade in elephant ivory was banned in 1990, but since then several auctions of tusks from elephants that have died naturally or were seized from poachers, have been permitted in Namibia, Botswana and South Africa. Supporters of the sales say that the revenue can be used to fund elephant conservation, but critics say that any legal trade masks the black market trade and encourages poachers.